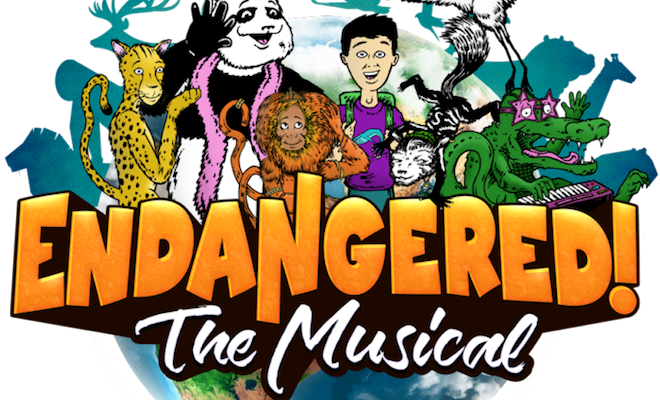 Beginning this Sunday the recently extended hit family musical Endangered! will introduce its THE ENDANGERED CLIMATE TALKBACK SERIES, following the Sunday performances (3pm curtain, talk back begins at 4:30pm) at the Davenport Theatre (354 West 45 Street). The Talk Back series is FREE to the Public, but tickets to Endangered! The Musical are $25, $49.75, and $69.75 (premium) and can be purchased by visiting Telecharge.com. THE ENDANGERED CLIMATE TALKBACK SERIES welcomes devoted environmental experts and activists to speak on the many aspects of climate change and related issues and concerns, including endangered species preservation, education and outreach, and sustainable solutions. This series will speak to the most current issues and thinking on climate change and its causes, habitat loss and species preservation, and the best strategies to educate the younger generation – including arts and entertainment vehicles such as Endangered! The Musical. “With residents of Texas and Louisiana barely drying off from Hurricane Harvey, and Hurricane Irma buffeting the Caribbean and bearing down on the US, with historic wildfires in the western US and superstorms around the globe, there is no time to lose in discussing and illuminating the topic of global warming and climate disruption. The central message of Endangered! is about the importance for people of all ages of being aware of the changes taking place all around the world, the impact of those changes on both animals and humans, and the importance of caring for and celebrating all life on the planet,” said Endangered! book writer, Keni Fine. ENDANGERED! is a multi-cultural, multi-species, rockin’ crockin’ musical about a social media Whiz Kid reporter and a group of famous endangered animals from around the globe, who must survive an unexpected superstorm! Stranded at the zoo when Superstorm Beyoncé hits New York City, the Kid and the endangered animals must quickly learn to understand and respect each other, coming together as one in order to save themselves from the flood! ENDANGERED! is Off-Broadway’s newest hit family show, originally commissioned by the Friends of the National Zoo and created in conjunction with the Boys & Girls Clubs of Greater Washington’s TAP Arts Camp. In the summer of 2013, Endangered! had a staged reading at the National Zoo, then premiered live-streamed on the Kennedy Center Millennium Stage. Inspiring, engaging and ‘wildly’ entertaining, Endangered! has melodies that are renewable, and harmonies that are sustainable, making this groundbreaking eco-musical uplifting and enjoyable for creatures of all ages! Who knew saving the world could be this much fun? Visit EndangeredTheMusical.com for updates and more information.